Wholesale pricing is offered to the trade only. 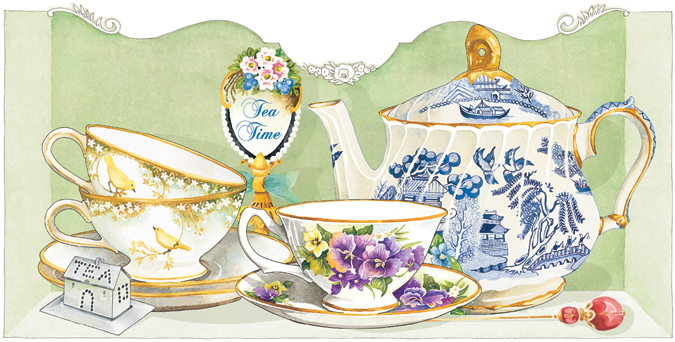 Businesses that carry this line of Teacup Greeting Cards include Tea Rooms, Gift Stores, Florists, Boutiques, Museum Gift Shops, Historical Houses, Antique Stores, British Shoppes, Irish Shoppes, Gourmet Food Stores, Book stores, Bed and Breakfasts, Country Stores, Garden Shops, as well as Victorian parlors. Other establishments, such as women's groups, fund raising and health care organizations, use my cards for promotions and thank you's. 1. CREATE AN ACCOUNT from the menu at the top of this page to provide name, company, address, and email (it takes about 3 minutes). Your account automatically registers as a Retail Customer pending review of your Resale Certificate (see #2). 2. EMAIL YOUR State's Issued RESALE CERTIFICATE aka Sales and Use Tax Certificate, to kim@kimberlyshawgraphics.com and state your interest in becoming a New Wholesale Customer in your email. With a smartphone, simply take a clear photo of your Resale Certificate and email the image at full size. Once we validate your Resale Certificate, your account will be updated by our office, providing you with Wholesale Pricing online, plus a few additional products only available to the Trade. You will be notified via phone or email when your account has been updated to Wholesale status. Quantities: Each item must be ordered in quantities of six (6,12,18, 24, etc) for wholesale terms. Minimums: Minimum opening order for New Wholesale Customers is $100 of product which includes an additional FREE set of cards as our "Thank You" for trying the line. Reorders are just $75.00 of product. Shipping: Freight is shipped FedEx Ground to Commercial Storefront locations, and FedEx SmartPost or USPS Priority Mail to residential addresses, PO Boxes, or rural locations, whichever is less. Orders are shipped the following business day. Payment: We accept Visa, Master Card, Discover, and AMEX. Office hours: 8am-4pm PST, Oregon, M-F. Please do not hesitate to contact me directly with any questions or to place an order over the phone.